Knowing how much I love really yummy food, it should surprise no one that I am leading N with a local restaurant fave. 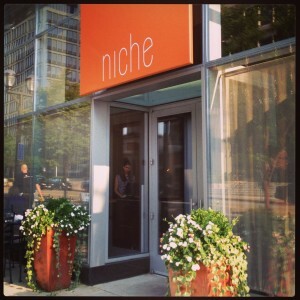 Niche is the first of the Gerard Craft restaurants I went to. I still remember the night when I had dinner with Ellen, Grant, Mike & Ray at Niche. And without a doubt, I still remember an incredible evening and the standout dish of the night the lemon-maple custard served in an egg shell. Seriously amazing dish. Since then, I have become a serious fan of Niche — I even went to an R& D dinner there where they were trying various things. Niche offers an incredible meal with every taste being complex and yet simple too. It is the best way to celebrate a special evening or simply treat yourself to a special night. The food, wine and atmosphere are impeccable. The Crafts have expanded Niche Food Group over the past few years and it offers several other choices. My favorite one is Pastaria! I’m a big fan of Italian food. Love wood-fired pizza and yummy fresh-made pastas and don’t get me started on gelato! In the event my enthusiasm doesn’t make you hungry, check out what you can find on Instagram… the Niche Food Group feed kills me at times! 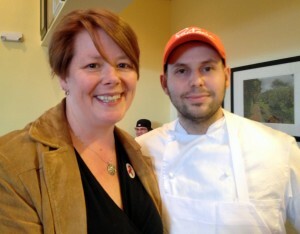 And I love posting my own photos from Pastaria! One of my favorite appetizers are the risotto balls and the garganelli with braised beef is a hearty pasta fave! There is a spicy pizza we had with friends recently that totally rocked my world and I keep wanting to get again. If you can’t choose just one dish, I recommend going with a group of ladies cause you can try lots of favorite dishes. And when Hog & Hominy took over the pizza oven, I snagged a shot of all the chefs together! But one of my favorite Pastaria trips was when Julie and I had a great conversation with Gerard Craft about the kind of wheat they use in pasta comes from Arizona, because semolina is the bomb when it comes to pasta! Maybe some would leave this one off the list but I have to mention that rapper Nelly is from St. Louis. He’s so St. Louis that he is a St. Lunatic — yes, that’s a real thing. He is probably known best for a couple of big songs. I can remember “Hot in Herre” making lots of folks dance and lots of folks hadn’t heard of getting a grill til “Grillz” went big. He routinely shows a lot of love for St. Louis in his music. Check out this old school song “Batter Up” by Nelly and the St. Lunatics and you may hear a shoutout to UCity, Missouri and in “Country Grammar” he makes it clear you know he comes from the Lou and is proud. Some folks probably wonder why I’d post about Nelly. The reality is he is a big force in St. Louis and I like a good bit of his music too. For folks who don’t like that genre, I have to say his willingness to do “Over and Over Again” a country song with Tim McGraw probably solidified my interest. I enjoy a lot of hip hop and rap, don’t get me wrong but love that he is willing to see musically differently. Danielle gave me this one and from what I can tell, Norton grapes are native to the Americas and used in some Missouri wines… I’m going to have to do some research on this one! The St. Louis A to Z will not be finished in April, but that’s ok…. I can keep the series going til it finishes. You may be interested in the series I did last year an A to Z of Agriculture! The N post was for nutrients.